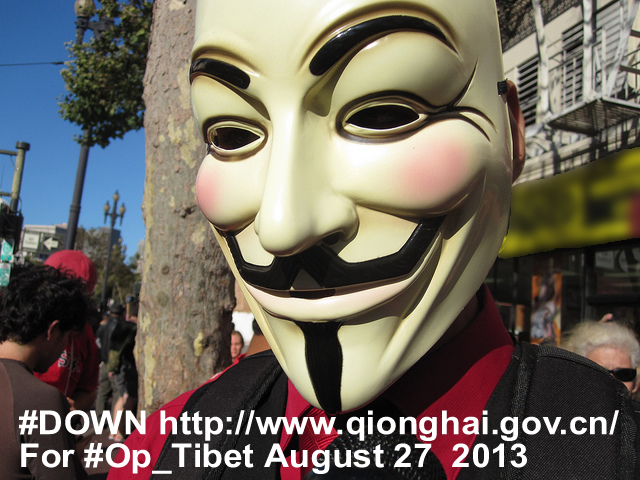 The image above was today posted on an Anonymous Blog called ‘OpTibet’ and reports another Chinese government site http://www.qionghai.gov.cn/ was crashed for over 48 hours following a denial of service attack, in the ongoing Anonymous action called Operation Tibet. Many thanks to @AnonymousTibet for the heads-up on this,which is another embarrassing reminder for China’s regime that its sites are being successfully targeted in support of Tibet and its people. THANK YOU SO MUCH FOR SUPPORTING TIBET!!!! To the world china look like a giant…but giant organs are not working properly as chinese people don’t feel that their own government do any benefit for them…its a shame that world are still waiting but not taking any action against the violence that is going on in Tibet. Reblogged this on New World News.